I don’t spend my days looking for ways to eat tofu. I’m a carnivore in conflict. I cry at the sight of a dead squirrel then go home and make a pot roast. But I do love what tofu has to offer: a clean conscious, low fat soy protein, vitamins, minerals, antioxidants…the list goes on and on. The cold autumn air put a click in my step when running 12 long miles yesterday, but it seeped through my skin and chilled me to the core. Consuming something spicy was vital to heal the bones and sooth aching muscles. The red pepper flakes and habanero give these noodles quite a kick but the coconut milk appeases the palate just in time to take another bite. Spicy Coconut Noodles are aromatic, fiery and packed with body curing protein and carbohydrates. They were just what the doctor ordered. Before you heat the wok, slice and dice the vegetables and tofu, whisk the sauce ingredients together, and prepare the noodles based on package directions. Set aside in an assembly line. In a wok (or large sauté pan) heat oil on high until it begins to ripple. Add the tofu, soy sauce, fish sauce, kale, mushrooms, red pepper flakes and habanero pepper and cook for five minutes, stirring constantly. When the kale, tofu and mushrooms are tender turn the heat down to medium. Add the edamame, bell pepper, carrots and shallot cooking briefly for one minute. Add the sauce and let it come to a simmer. As soon as it simmers, turn off the heat. Combine the ingredients with the noodles and let it come to room temperature. Top each serving with thinly sliced green onions. 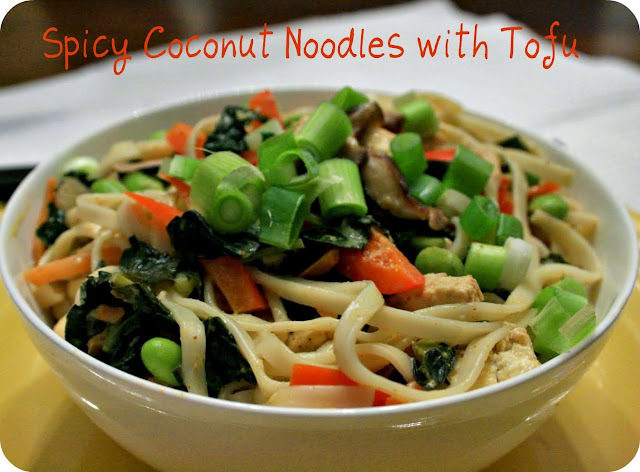 Spicy Coconut Noodles are best at room temperature but are great cold and hot too! This noodle bowl looks delicious! I am not a fan of tofu, but here I think it all works together very well. The flavors are perfect! This dish does look healthy as well as tasty. The ingredient in the sauce alone has my mouth watering. Yum! Oh, boy, this looks marvelous! I'd be eating it for lunch and dinner till it was gone...yum! I do love some coconut noodles - and where I am pretty sure my meatatarian side will always prevail, it is nice to see recipes with options for when I feel the need to be healthier. Made this tonight after finding it on Pinterest. Used different veggies I had on hand like broccoli and it was DELICIOUS! I will definitely be keeping it in my stir fry repertoire! Thanks so much for another fabulous sauce! Wonderful! So happy you liked it!